This article originally appeared on npENGAGE. As the VP of Corporate Citizenship and Philanthropy at Blackbaud, my colleague Rachel knows firsthand about the power that social good initiatives can truly have and the important role that corporations play in achieving meaningful impact. In addition, Rachel, along with other experts and professionals in the field, recognize that the role of corporate social responsibility (CSR) in the for-profit world is constantly changing as societal needs shift, legislation and policies change, and expectations from the public evolve. Consumers are expecting more from the organizations they do business with, including a deeper level of community involvement as well as a commitment to issues on a larger, global scale. Simultaneously, high potential talent as well as current employees are placing increased significance on a company’s philanthropic giving, and engagement efforts when considering their career development and weighing potential job opportunities. To help shed a little light on the dynamics currently at play as well as the shift in focus we have seen in the corporate giving and engagement space, we turn to some of the beliefs and best practices of our own Blackbaud expert and thought leader Rachel Hutchisson. Rachel’s influence and connections across the social good sector, paired with her work and the expertise she has built working for years within the space, puts her in a unique position at the center of critical conversations around driving social innovation. 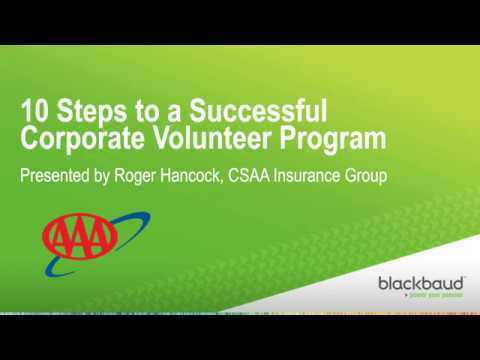 Here at Blackbaud, she leads a corporate citizenship program for more than 3,000 employees located around the globe that includes a wide array of volunteering and giving opportunities. In addition to leading the CSR efforts at Blackbaud, Rachel was recently named the Chair of The Giving Institute for 2017-2019 and is also a member of the board of directors for the Association of Fundraising Professionals (AFP) International, and the Coastal Community Foundation. She also participates as a thought leader and contributor in the space, providing insights across many different platforms including webinars, podcasts, Forbes articles, a Tedx Talk, and even during events at the White House. We know what you’re thinking, but surprisingly, no, she does not contain any superpowers (besides an incredible dedication to the promotion of social good). Traditionally, the relationship between corporations and their philanthropic efforts has been referred to as corporate social responsibility (CSR); Rachel believes that this category has grown and shifted. Limiting social responsibility to just corporations does not accurately tell the story of what's happening in the broader sector. Social responsibility is not limited to just corporations, and a need has arisen for a new term to summarize these types of philanthropic efforts. In her own words, Rachel says, "I believe that the focus on ‘corporate’ is actually limiting - It's time to shift to Human Social Responsibility (HSR)".​3 HSR more accurately highlights the shift away from traditional CSR toward the growing importance of focusing on the individual. This idea of the individual change agent is also closely aligned to the millennial workforce, and the way they give, what they value in an employer, and a desire to achieve purpose in their day-to-day lives. In the lens of corporate philanthropy Rachel says, "Companies following this trend are beginning to look beyond their corporate imperatives with the understanding that their employees' purpose – and their community's social good needs- play into CSR. 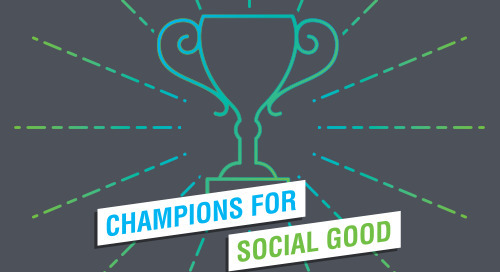 Corporations are changing their approach to their employee giving and volunteering programs. "​5 A company driven by the values of its employees would, instead, take a very open approach, allowing the individual to choose what cause matters. The belief that philanthropy is personal is at the heart of an employee-centric approach to CSR. These programs enable employees to feel valued and ultimately increase employee engagement. In addition, Rachel believes that companies should try to find the commonality between their own organizational goals and broader societal goals, ensuring the organization’s financial and social responsibilities share equal priority. The result is a sense of shared value within the company, which research shows can positively affect the overall bottom line of the business. 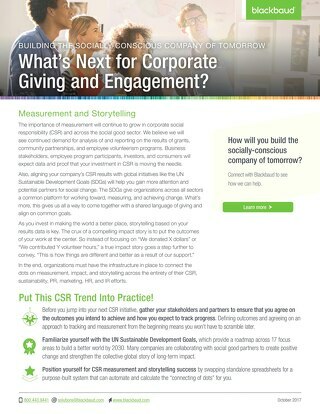 In order to accomplish these goals, it is important to take a holistic approach to corporate giving and engagement. It is imperative that all areas of an organization that are dedicated to social responsibility work together to track data and measure the effectiveness and impact of these initiatives. 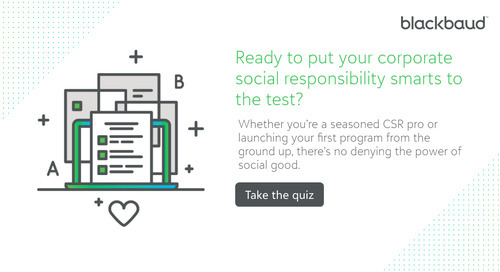 “Social responsibility and HR should work together using data gained from engagement and volunteerism surveys — to determine what programs are most compelling for each audience. "​7 Through her experience she has learned that there are a lot of things that go into the development of a sustainable CSR program. "You have to be clear about what you are trying to accomplish, because you have to think about how you really want to scale it and grow. "​8 In addition, you have to have the right technology in place to track the ultimate impact your programs and organization are having. After all, trying to communicate your impact story without tangible data points is like getting “famous person” as a hint in a crossword puzzle. The more detail the better. Lastly, the other key to success is remembering to look to experts and peers in the field for guidance and tips along the way. At the end of the day it is our coordinated and collaborative efforts that will truly help move the needle. 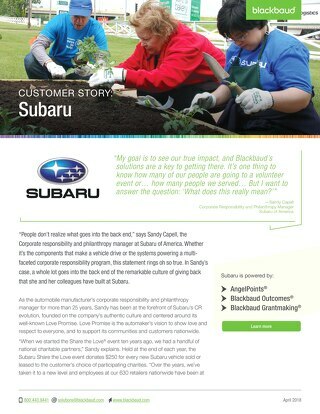 Want to learn more from Blackbaud’s resident CSR expert? 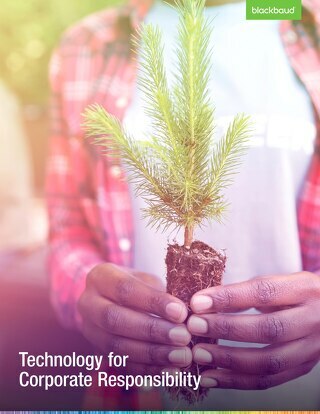 Check out Rachel’s podcast on Human Social Responsibility and how it is innovating the way companies run their CSR programs here. On the Champions for Social Good Podcast, Jamie Serino speaks with Dr. Chris Stout, Founding Director of Center for Global Initiatives about innovative humanitarian strategies advancing global health.